Amazon’s Alexa is the Queen of smart speakers, but her reign may soon come to an end if Google has anything to say about it. In an effort to dethrone Alexa and carve a solid niche in the world of home automation they unveiled not 1 but 4 all-new smart speakers at CES 2018 engineered to make your life easier while giving the Echo Show a real run for its money. Question is, do they measure up? Let’s find out with a closer look at these gadgets and what they can do. As the owner of an Echo Dot, Echo Show and Google Home Mini I have to admit I am a bit partial to Amazon. I find Alexa to be a bit easier to integrate into my everyday life, as she partners with more brands, and the speaker quality is a bit clearer. Plus, Alexa has a few more skills and the Show has a screen, so I can see recipes and video clips- something Google didn’t offer- until now. Their new smart speakers have screens and improved sound, which has me intrigued, to say the least. The one advantage of the Mini for me, and it’s a big one, is that I can “google” while talking to it; so the prospect of a screen paired with that may just be enough to entice me to the other side…. maybe. Google has 4 new displays for consumers to ooh and ah over from LG, Lenovo, Sony, and Samsung’s own JBL, all designed in the hopes of becoming a part of your everyday life. And putting a major dent in Amazon stronghold on the market. Just like the other speakers already available, they can do all the same stuff, from streaming tunes to controlling your smart lights and giving you directions. But thanks to the touchscreen they can also show you videos, help you place video calls or look at photos- all with a simple voice command. And while these speakers can work anywhere, much like the Echo Show, they are aiming to take up permanent residence in your kitchen, which is quickly becoming the epicenter of smart devices. It’s where families gather and moms spend most of their time, so it makes sense this is the space they want to invade. It’s also why the screen is so handy- you can cook while watching a YouTube video on how to do it or video chat with your mom while cleaning out the fridge. Improved Speakers/microphones: All 4 devices are fitted with quality speakers and are better than what you would find on your tablet. This means not only do you get better playback, but each gadget can also hear you more easily, even from across the room. That being said if you want to throw a party you’ll need something a bit stronger. Improved Privacy: Since these speakers are always “listening” you need to keep them plugged in at all times; but don’t worry, in a nod to privacy Google has added a mute switch, so you can turn it off when and if you need to. 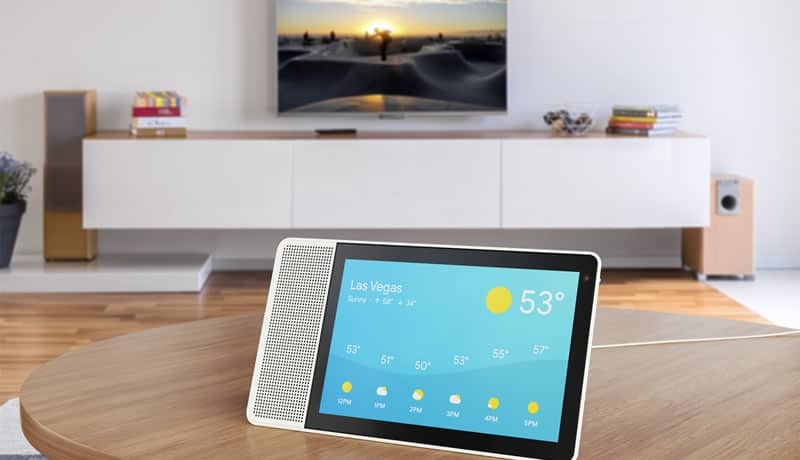 Improved Interactions: Operating just like a Google home, with the addition of a screen, it can provide you with images of your calendar, kids, the weather, or a recipe. All of which is personalized based on who is talking since Google Assistant can recognize users by voice. Add appointments to your calendar or ask it to show you directions and it will do it in an instant. My only gripe is that you have to say Google when interacting- I prefer using an actual name, like Alexa. Also, to up its ability to compete with Alexa, Google has added a directory listing all the things your Google assistant can do similar to the one you would find in the Alexa app. Now that you get an idea of what these speakers can do, let’s get a better look at the Lenovo Smart Display and JBL Link View; as of now there is no additional info on the Sony or LG Speakers. 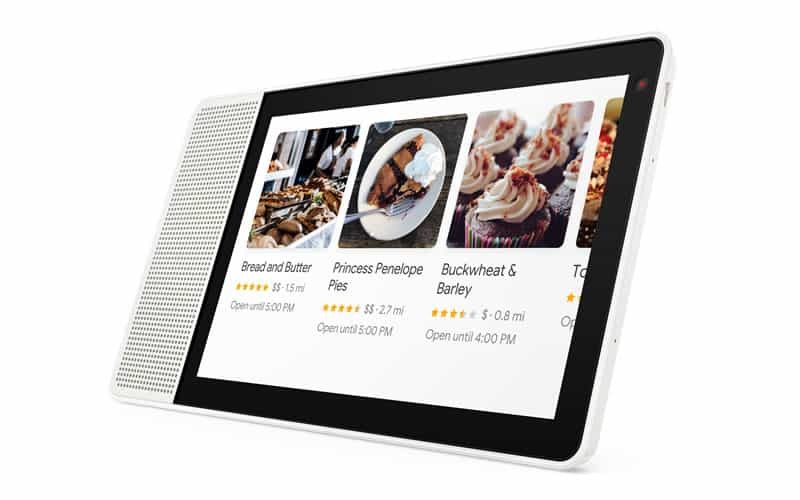 Similar in style to Amazon’s Echo Show, the Lenovo Smart Display boasts a quality speaker that may not work for a house party but is perfect for jamming to while you cook or clean. For me, the style is a bit boring and I’m not crazy about the white color- which can be a pain to keep clean. However, it is quite slim and light, so I’ll reserve full judgment. It comes in 2 sizes, an 8″ display and a 10″, with the 8″ costing around $200 and the 10″ going for $50 more. It is expected t be available in the summer. The JBL speaker may be the more impressive one in terms of sound thanks to not 1 but 2 10-watt speakers built into it on either side for more even sound distribution; which means if you’re having a backyard barbecue or a small dinner party they may just get the job done. It’s also more impressive when it comes to looks; the oval shape is sleek and fun without taking anything away from the 8″ screen. And I like the black color of the casing, which is less likely to show your kid’s fingerprints when (not if) they touch it. No word yet on how much it will cost but it is expected to be released in the summer. As you can see, Google is giving Alexa fans lots to think about thanks to these ingenious Google Assistant Smart Speakers. Each of these devices has the ability to provide consumers with everything the Show can at a comparable price. But the question remains: are they as good? We’ll just have to wait and see.